Two pronounced murder cases in Livingstone were among the felonies heard shortly after the opening of the Livingstone High Court this week. One case involved the murder of a tenant by a landlord. This was in matter in which Mate Katufi, 34 together with his brother Friday Katufi, were accused of gruesomely murdering Veronica Mase who happened to be Katufi’s tenant in Livingstone’s Kashitu area at the time of her death. Facts before the court are that the accused persons Friday Katufi and Mate Katufi while acting together stabbed Mase to death contrary to Section 247 of the Penal Code for allegedly failing to settle rentals. The brother is alleged to have pinned down the deceased while Mate Katufi stabbed the widowed lady. The other case involved a 24 year old self-claimed prophetess who is allegedly to have caused the death of a man in mysterious circumstances. This is in the case of Florida Kalembe versus The people. Facts before the court are that on January 17,2010 the ‘Prophetess ’Kalembe together with two others conspired to cause the death Godfey Kayowana contrary to Section 200 of the Penal Code. In the matter Kalembe is believed to have approached Kayowana asking him to give her K15million,the money she was later going to multiply into Billions of Kwacha using her magical powers. Hotel around 23hrs on the fateful night. The following day,Kayowana was found strangled and dead in the Musi-o-tunya National Park. A man-hunt was mounted by Police and three suspects,the Prophetess Kalembe being one of them,where picked in connection with the murder of Kayowana. High Court Judge Ernest Mukulamutiyo adjourned the two cases to January 17 for continuation of trial. How can you have a name for amafi and waba umutuntulu ? I feel sad for the poor widow.MHSRIP. Fund Manager sure,how can he buy such a story? MHSRIP. Ba Lt why consor w.aba umutuntulu ? yaaa calling your friend KATUFI (we mafiwe), you can be stabbed, unfortunately is was to death. Sad indeed. Stu.pid as it may seem but i partly sympathise with the accused landlords. Those who rent their properties out would understand how frustrating some tenant can be. Some people are so stu.pid they think they can live in other people’s property without paying and obviously take advantage of the ludicrous long legal process required before eviction can be effected . As for the fund Manager he deserved it, how does a normal person give a criminal such amount of cash and then agree to meet her at such an awkward time? Friday and Mate tutufi for real! This is where “the of money” can lead you. Just send Judge Wanki to go and pass Judgement on these two cases. The Culprits will then know how evil it is to cut short human life. Judge Wanki knows well how to sentence such people. Cage the army…..Ka ginger kautwala hande bati..mixed na ka wine so!!!!!! Again Livingstone makes it. What is going on with our southern brothers,, 2010 ended like this and this new years again the same stories ala bwafye. 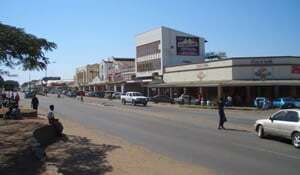 I didn’t read how barbaric those people in Livingstone have become, Zambia need change of government this year. People are niw doing what they want because they know they will be acquitted, or escape bails. It is these Lozis who are fighting for sucession, they really need to go back to Barotseland because they are really a nusence in Southern province of Zambia where everyone is free. If they want killings they should join that Barotse movement Mafia. Mutisebanya mwe, we are free in Livingstone where every tribe is represented like Lusaka and CB, even Ndebeles are free to mingle unlike Western province where every foreigner (Munyuku-nyuku) has to leave by 14th January. Sorry you got do what you got do!! Pipo pipo work up. Nowadays many of these so called prophets or pastors have a tendence of cheating pipo in their churches by demanding donations in the name of sacrificial offerings on the pretext that they will multiply it. Shame! Riches come by hard work, innovation & investing in yo talents. NO ONE CAN MULTIPLY MONEY 4 U. Have u not wondered why they fail to multiply it 4 themselves but always ask donations from u pipo? Chi Chomba, why do you hate the Lozis? People hate the Lozis out of prejudices. What is thre in Zed is that for the fact that am born this tribe its a must to hate the Lozis. What we know is that though half of the state hate the Lozis for nothing, there are stil a few who appreciate the Lozis. We are giant coz many people hate us but fail to pin us down. All i can say is murdering somebody is bad. May their souls rest in peace. People do not hate Lozis, they just dislike their agenda of claiming what does not belong to them. People hate to be colonised by again. @ dishonest shut your …as ..hole..